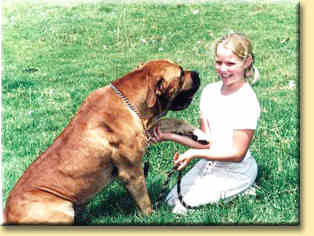 The Boerboel has been specifically bred as a protector. Their even character and friendly disposition should ensure that they are on top of your list as your next best friend. A well bred Boerboel should always be on your wave length and be ready to act when ever you feel threatened. The dog should also be able to sense when ever you feel uneasy about a specific individual, and he will no doubt make his presence felt in order to provide you with the necessary protection. This protective instinct is obvious even as a puppy. By training your animal to defend, you will find that he is able to growl like a lion and protect you with a ferocity that doesn't take its own safety into account. African animal need to survive in Africa, and the Boerboel is no exception. Boerboels have often beaten off an attack from a leopard, in fact Aristotle named the Boerboel's ancestors, Leontix (sons of lions). The Boerboel is a family dog, often spending hours playing with the children and accepting the protection of the whole family as his duty and cares for all of them. During the day the dog must go to the veldt with the children to guard the livestock. Whilst with them he should also catch them some lunch, probably a rabbit. He should also protect them against all danger including leopards. At night it was his duty to protect the entire family from any possible danger. The Boerboel is a well bred working dog, and they love working. Contact us for more details on how you can own one. 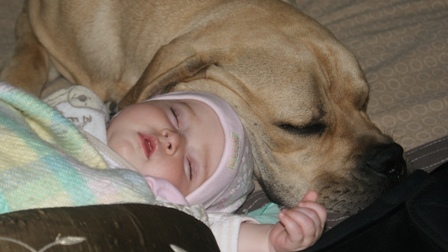 A Boerboel is a loyal and devoted family guardian that loves children especially. They very seldom bark, but when they do you can be sure it is for a good reason. 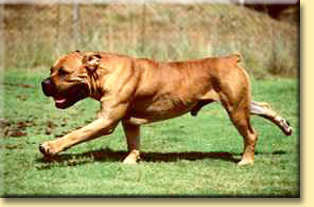 One of the early kennels said of its Boerboels that they were, "faithful, fearless, but not ferocious". This sums up a well-bred Boerboel today just perfectly. I have Veterinarian Certificates on the temperament and mental stability of each of my boerboels. The temperament tests are done every six months.